A return visit this spring revealed the original trail surface is holding up well. Very few bumps or cracks along the route, though riders on skinny tires may notice a few ripples in the surface from time to time. Facilities: 3 portable toilets along the route. No water source on the trail. Worth Noting: We found the connecting road route to be bike-friendly, as it was largely deserted. Much of the trail parallels an active railroad giving pleasure to train fans young and old. The line is indeed an active one. 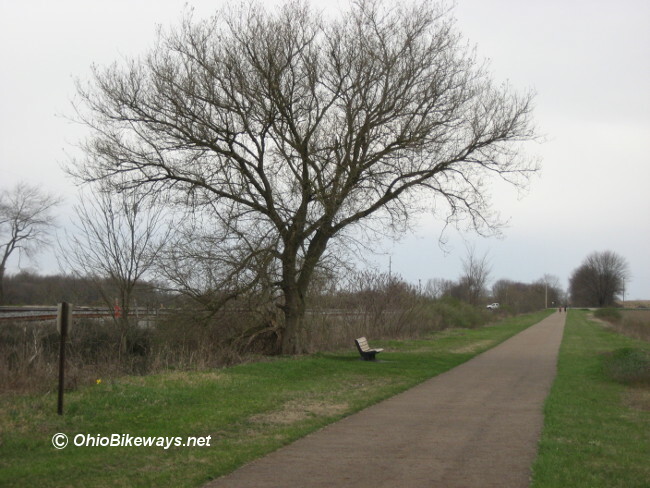 Trees do border the trail in several areas, yet you will be exposed on hot, sunny days along open spaces as well. But shade never seems far away, though you may have to move off the trail to take advantage. There were 3 portable toilets at different locations along the trail, but no water. For those looking to refill water bottles, try venturing into Creston or Rittman. There is a design treatment worth noting along the trail. The trail builders incorporated bends in the bikeway at two road crossings. While this is commonplace where roads are not perpendicular to trails, the purpose here was a bit different. The pathway was taken slightly uphill in order to give trail users better sight lines at crossings. At a more elevated position, trail users can see over higher ground and view oncoming traffic, making the crossings much safer. Originally trail builders had installed rigid center bollards along the trail, mostly near road crossings. In 2014, Jenni Reusser sent word that the center poles were being removed. On our return trip in 2018, we found that one center bollard remains along Atlantic Avenue. 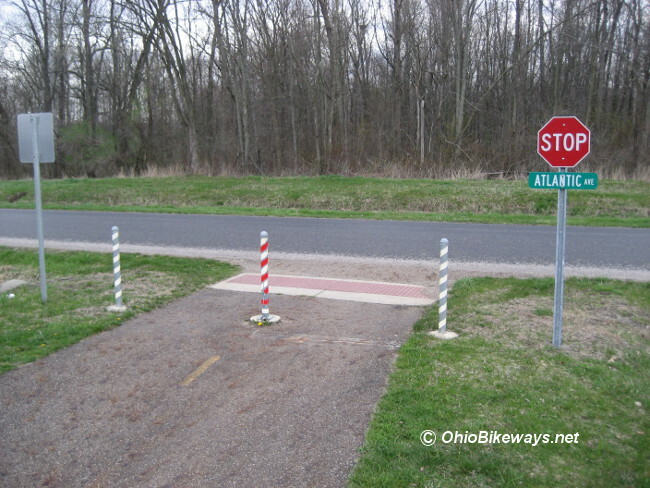 Thankfully the practice of using rigid center bollards has fallen out of favor along at least a handful of Ohio trails. That's an important shift in safety awareness that benefits all trail users. For those unfamiliar with this hazard, read our 'Trail Bollard Hazard' blog series.